Style: 2 Story "A Frame, Chalet"
Immaculate one-of-a-kind 3 BR home on a 7+ acre wooded hillside in a private cul-de-sac location. Impressive 2 story family room features lots of windows and a floor to ceiling stone fireplace. Enjoy the summer evenings on the large wrap-around deck. No central air needed with all the shade. 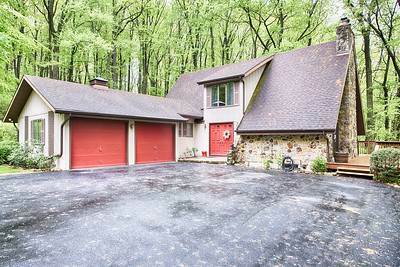 Easy access to Rt 78 makes this home ideal for the commuter. High efficiency furnace. 2 car garage. Septic system replaced in 2018. This one won't last long. No sign o property. Home is at end of long driveway. Do Not drive down driveway without an appointment.